Peripheral giant cell granuloma (PGCG) is an infrequent exophytic lesion of the oral cavity, whose etiology is still not precisely defined . In 1962, Gottsegen  suggested the development of PGCG often after periodontal surgery. However, some investigators consider it to arise in response to local irritating factors such as tooth extractions, ill-fitting prostheses, poor restorations, collections of food remnants, and calculus ,. Low socioeconomic status of the patients and unfavorable oral hygiene also seem to be predisposing factors to PGCG . Recently, Choi et al. reported the association of PGCG with hyperparathyroidism secondary to renal failure. It is also known as giant cell epulis or peripheral giant cell reparative granuloma accounting for 7% of all benign tumors of the jaw . The mandible is affected slightly more often than the maxilla . It usually presents as a purplish-red soft tissue nodule consisting of multinucleated giant cells in a background of mononuclear stromal cells and extravasated red blood cells. It is not a true neoplasm but may be reactive on stimulation. 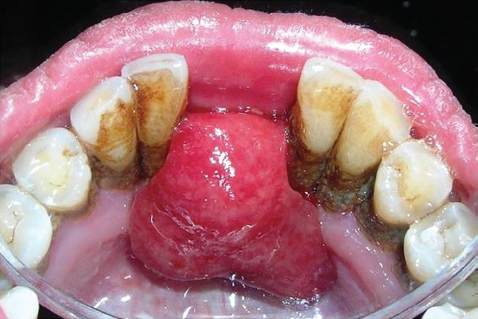 A 45-year-old man presented to the Department of Periodontology, Career postgraduate Institute of Dental Sciences and Hospital, Lucknow, India, with an exophytic lesion in the mandibular anterior region since 8 months. Initially, the patient was not very concerned about the lesion, but its growing size made him seek treatment. On clinical examination, the lesion was nontender on palpation, but the patient gave a history of bleeding, usually when interfered accidentally with the occlusion while biting. 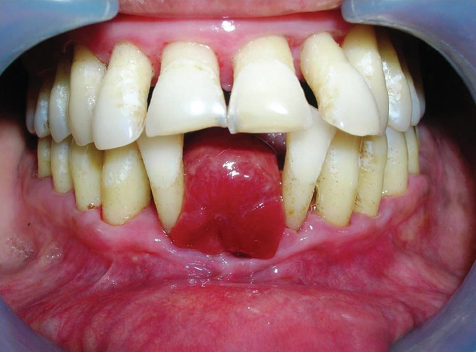 The lesion was reddish, soft, and ulcerated covering the 31 and 41 tooth region [Figure 1] and [Figure 2]. The patient's general hygiene along with the oral hygiene was not too good. He was systemically healthy and was not under any sort of medication. Clinical differential diagnosis included PGCG, pyogenic granuloma, and hemangioma. Excisional biopsy for the lesion was planned to rule out the differential diagnosis. 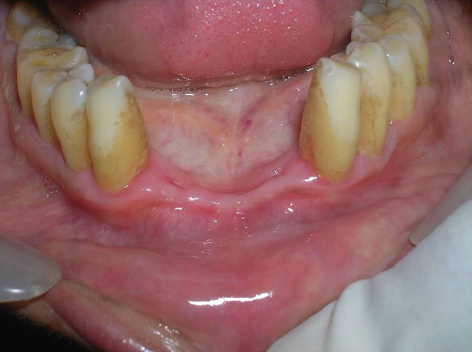 Full-mouth scaling and root planing was carried out and patient was followed up after 1 week [Figure 3]. The tissue was excised to full length from both the buccal and lingual aspect of the involved region with the help of B.P blade No. 15 [Figure 4]. Hemostasis was obtained using pressure pack and gel sponge. The area was examined properly for the presence of local irritating factors (subgingival plaque and calculus). Thorough scaling and root planing was performed and the area was irrigated with physiological saline. The patient was advised for chlorhexidine mouthwash for 2 weeks and antibiotic and analgesic for 5 days. The biopsy report obtained showed that the lesion was composed of aggregates of multinucleated giant cells in a background of mononuclear stromal cells, extravasated red blood cells, and deposits of hemosiderin. 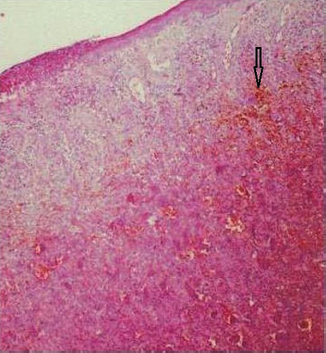 The lesion was surrounded by bands of fibrous connective tissue stroma [Figure 5]. Hence, the histopathologic picture was diagnostic of PGCG. 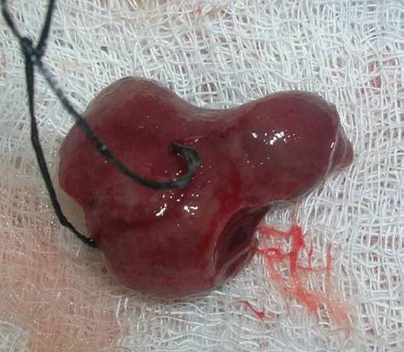 The patient was followed up after 6 months, and the surgical area showed uneventful healing [Figure 6]. Figure 1: Preoperative facial view. Figure 2: Preoperative lingual view. Figure 3: One-week follow-up after scaling and root planing. Figure 5: Histopathological findings revealed aggregates of multinucleated giant cells in a background of mononuclear stromal cells, extravasated red blood cells, and deposits of hemosiderin (H and E stain, ×100). Figure 6: Six-month postoperative follow-up. 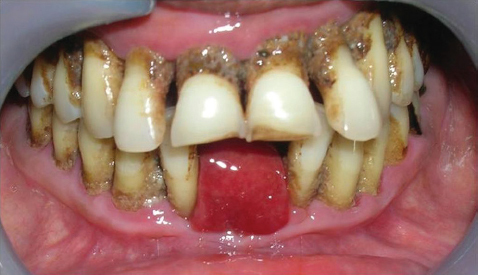 PGCG is a benign reactive lesion of the oral cavity, originating from the periosteum or periodontal membrane, following local irritation or chronic trauma . Bernier and Cahn proposed the term 'peripheral giant cell reparative granuloma' for the lesion . The latter terminology is currently not being used, as the reparative nature of the lesion has not been proved. Today, the term PGCG is universally accepted. They arise interdentally or from the gingival margin, occur most frequently on the labial surface, and may be sessile or pedunculated. Ulcerations of the margin are occasionally seen. The lesions are painless, vary in size, and may cover several teeth. They may be firm and/or spongy and color varies from pink to deep red or purplish blue . The exact etiology of PGCG is unknown. Local irritation factors such as poor dental restorations, dental extraction, plaque, and calculus accumulation play significant role in the development of a PGCG . Generally, PGCG size varies from 0.5 to 1.5 cm in diameter. There are no pathognomic clinical features whereby these lesions can be differentiated from other forms of gingival enlargement. Microscopic examination is required for definitive diagnosis. The PGCG has numerous foci of multinuclear giant cells and hemosiderin particles in a connective tissue stroma. Areas of chronic inflammation are scattered throughout the lesion, with acute involvement occurring at the surface. The overlying epithelium is usually hyperplastic, with ulceration at the base . In the present case, all these features were present. The treatment of choice is surgical excision with the suppression of the underlying etiologic factors. The periosteum must be included in the excision to prevent recurrences; in fact, recurrence is frequent and is observed in 5 and 11% of cases according to Eversole and Rovin  and Mighell et al. , respectively. Curettage in addition to the excision to remove the base of the lesion also has been suggested. PGCG is a lesion of unknown etiology, which requires immediate diagnosis and treatment. Microscopic study provides confirmed diagnosis and helps in the definite management of the lesion, thus preventing it from damaging the adjacent tissues. Ghimire N. Peripheral giant cell granuloma: a case report. J Chitwan Med Coll 2013; 3:28–30. Gottsegen R. Peripheral giant cell granuloma following periodontal surgery. J Periodontol 1962; 33:190–194. Jaffe HL. Giant-cell reparative granuloma, traumatic bone cyst, and fibrous (fibro-oseous) dysplasia of the jawbones. Oral Surg Oral Med Oral Pathol 1953; 6(1): 159–175. Bernier JL, Cahn LR. The peripheral giant cell reparative granuloma. J Am Dent Assoc 1954; 49(2): 141–148. Eronat N, Aktug M, Giinbay T, Unal T. Peripheral giant cell granuloma: three case reports. J Clin Pediatr Dent 2000; 24(3): 245–248. Choi C, Terzian E, Schneider R, Trochesset DA. Peripheral giant cell granuloma associated with hyperparathyroidism secondary to end-stage renal disease: a case report. J Oral Maxillofac Surg 2008; 66(5): 1063–1066. Neville BW, Damm DD, Allen CM, Bouquot JE. Soft tissue tumors. In: Neville BW, Damm DD, Allen CM, Bouquot JE, eds. Oral and maxillofacial pathology. 3rd ed. St Louis, MO: Saunders; 2009. 507–563. Katsikeris N, Kakarantza-Angelopoulou E, Angelopoulos AP. Peripheral giant cell granuloma. Clinicopathologic study of 224 new cases and review of 956 reported cases. Int J Oral Maxillofac Surg 1988; 17(2): 94–99. Yadalam U, Bhavya B, Kranti K. Peripheral giant cell granuloma: a case report. Int J Dent Case Rep 2012; 2:30–34. Falaschini S, Ciavarella D, Mazzanti R, Di Cosola M, Turco M, Escudero N, et al. Peripheral giant cell granuloma: Immunohistochemical analysis of different markers. Study of three cases. Adv Odontoestomatol 2007; 23:189–196. Eversole LR, Rovin S. Reactive lesions of the gingiva. J Oral Pathol 1972; 1(1): 30–38. Mighell AJ, Robinson PA, Hume WJ. Peripheral giant cell granuloma: a clinical study of 77 cases from 62 patients, and literature review. Oral Dis 1995; 1(1): 12–19.